Don't laugh. I didn't know there was a such thing as a fogless mirror. I always figured if I really needed to see in a steamy bathroom, I'd have to break out my blow dryer or crack open the door, neither of which is convenient. Apparently, there are fogless shower mirrors for shaving that are meant to stay clear. Designed for men, I'm assuming, to be able to shave in the shower, which is better for the skin (goodbye razor burn), you can totally stand in your super steamy shower and the mirror stays clear. I'm not a guy and my husband doesn't shave in the shower, but I actually find it better for plucking my eyebrows. The same rule kind of applies here - the pores are more open so hair is easier to remove. It's less painful and I can get the really difficult itty bitty new growth much better. Cassani Company, who makes the mirror I'm reviewing, claims their "anti-fog nanotechnology repels fog." Technically that is true and yes, this mirror seems to work well. But the nanotechnology bit makes me laugh because, well, you can find a way to use that term for almost anything product-related. It's a buzz word and it's overused. I can see why they are marketing it that way, but I'd rather simple honesty than marketing-speak, especially when the product works and doesn't need to oversell it's claim. Cassani Company is in the process of updating their website. When I first visited, I was worried I had the wrong link. Looking at the product packaging and having had the product in my hands, it doesn't match the visual look of the web style. I thought I was at a home remodeling website, not a product design company site. The mirror is an inexpensive, simple home product. It's not high end, not fancy. It does what it's designed to do and does it simply, so don't let the website have you thinking this is a designer mirror. It's functional and it works, but it's not fancy. 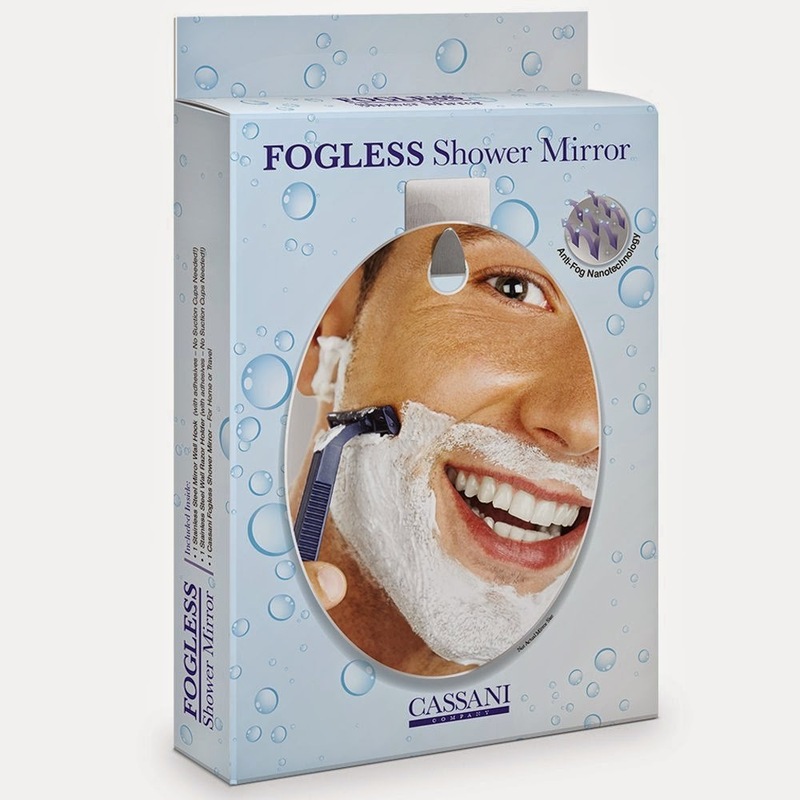 If you want more information and additional input from other reviewers, be sure to check out the Cassani Fogless Shower Mirror. The package includes the mirror and wall mount, plus a razor wall mount. It's nice to keep the razor off the shower floor, where it could get stepped on. I mounted my mirror to the glass wall of my shower because I figured it might be easier to remove if I had to take it down. We have a 10-year-old fiberglass shower and my experience with sticky stuff and fiberglass is that things stick REALLY well. So basically, my fear is that it'll be permanent and perhaps less so on the glass. I cleaned the glass well before applying the stickered mirror hook and found everything installed quickly and easily. It took 30 seconds. Super fast. This is a very convenient mirror to have in the shower. It's the right size for face shaving, for guys - or for eyebrow plucking for women, and it's lightweight so I'm not worried about it falling off the shower wall. I received a Cassani Fogless Shower Mirror for free using Tomoson.com. Regardless, I only recommend products or services I use personally and believe will be good for my readers.